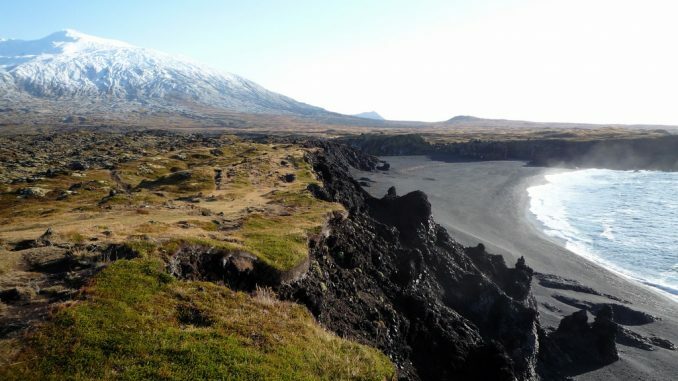 Snæfellsjökull National Park sits on the Snæfellsnes Peninsula and is best known for its signature glacier called Snæfellsjökull. As well as the mighty glacier you can also enjoy amazing lava tubes and lava fields here and the site also attracts a wide range of local flora and fauna. Nature lovers can go whale watching and bird watchers will find a plethora of local coastal species. The park is covered in attractive hiking trails and you can climb up and walk along the glacier depending on the time of year. Interestingly, it is this glacier that was featured in Journey to the Centre of the Earth by Jules Verne. Dynjandi is known for being one of the most beautiful waterfalls in the Westfjords part of Iceland and is situated on the Dynjandivogur Bay. The waterfall gives way to lots of smaller waterways as you ascend to its location before you finally see the main event, the raging waters of Dynjandi. The area in which the waterfall sits is a protected nature reserve and there is also a camping area here if you want to stay and take in the majesty of the waters for a while longer. Bear in mind however that the falls literally thunder over the side of a mountain so this is not the quietest area to lay your head. Much of Iceland is made up of far flung locations and craggy scenery, but Hornstrandir Nature Reserve is all of that and more. The terrain here is spectacular and you will find dominating sea cliffs, thundering waterfalls, and romantic mountain bluffs. Anyone who enjoys hiking should not miss the chance to go walking in one of the most remote parts of the country where you will have a good chance of seeing cute Arctic foxes as well as seals and the occasional whale. If possible you need to come here in the summer season from June to August as outside of this period the weather is changeable and the park may be closed.